Who is that guy? 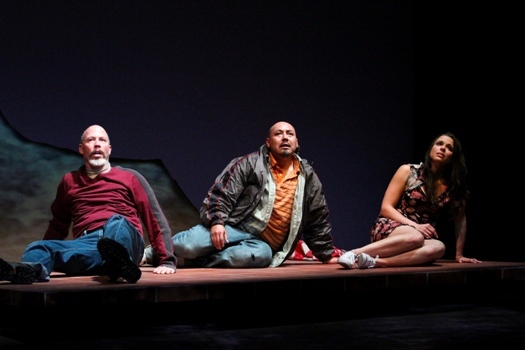 The question is much deeper than you might think, as illuminated in the San Diego Rep’s world premiere of “Tortilla Curtain.” Based on T.C. Boyle’s iconic novel, the play delves into some of the stickier aspects of race and class, but unfortunately trades nuance for cheap laughs. The story begins with an actual collision, as nature writer Delaney Mossbacher (Mike Sears) hits illegal alien Cándido Rincón (Kinan Valdez) with his Lexus. Mossbacher lives with his Valley Girl wife and invisible stepson in a soon-to-be-gated community up the hill. Rincón lives with his pregnant wife in the canyon. They are neighbors by proximity, but their lives are miles apart. For Mossbacher, the accident is the first in a series of incidents that completely unhinge him. He is conservative by temperament, rather than by politics, and doesn’t do well with change. For Rincón, the accident is a harbinger of bad luck getting worse. He is trying to earn enough to find an apartment for him and his wife, América (Vivia Font). But the accident sets him back, and living in the canyon, at the mercy of both natural and criminal elements, it’s hard to get back on track. Part of the genius of Boyle’s novel is the care with which he approaches these disparate realities. Unfortunately, that subtlety does not translate onto the stage. On the hill, paranoid white people fume against illegal aliens and their many crimes. In the canyon, Latinos show off their machismo with hip-thrusting swagger. The stereotypes keep coming: the ditzy wife, the petulant teen, the over-sexualized Latina. These characters would fit perfectly in a production by Culture Clash, where the over-the-top comedy skewers stereotypes. But this staging only perpetuates them. The cast is capable, with what they’ve been given. Font, in particular, stands out playing América as a dignified human being. The set is wonderfully functional, as it doubles as both canyon and hilltop dwellings. Sam Woodhouse’s direction is odd — not only for the characterizations but also the timing. He seems intent on getting through this as quickly as possible. With the show running only 90 minutes, he certainly had time to spare. This is particularly egregious in a scene in which Mossbacher makes a decision seemingly contrary to his beliefs. There’s very little hesitation and zero remorse. He just does it, quickly. The last few minutes are expertly done, ending the production on a high note. But it doesn’t absolve the constant reliance on low-hanging fruit. “Tortilla Curtain” is, after all a story about gray areas. It’s unfortunate they got lost in translation.